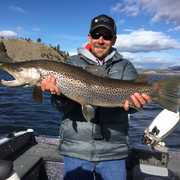 These tips will help make your next trout fishing excursion successful, especially when it comes to fishing with mouse flies. The first week or so of June is either spectacular or spectacularly tough fishing here in the Rockies. Depending on snow, runoff, and the weather, there’s often a short window of fishing before streams become rivers too dangerous to wade. That wasn’t the case this past June in Montana. Chris Cutler and I drove up to Montana to meet Bryan Allison, a guide based in Helena. The plan was to hunt big brown trout at night – with mouse flies, or ”mousing,” as it’s called. I was skeptical to begin with. Not because I don’t think mousing is effective. Rather, I doubted my own abilities to do it effectively. Then Bryan took Chris and me to see the stretches of river he wanted to fish. Bryan didn’t have to say anything. I could tell the water was higher than normal. It was high enough that fish would be isolated into the few pockets of calm water. The three of us spent the next three nights fishing with mouse flies. This was my first time dedicated to fishing just mice, and though I didn’t get skunked, I didn’t do too well either. Luckily, Bryan and Chris are pros at this unique branch of fly fishing. More than once, I had to remind myself to stop and watch. I’m a firm believer in learning through observation and imitation, especially in fly fishing. Granted there’s not much to see when you’re fishing at night, but I still feel like I learned enough to strike out on my own and do it. 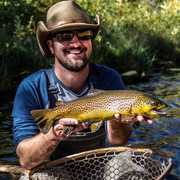 If you’ve seen mouse flies for sale in your local fly shop or something else has sparked your curiosity about mousing, these tips will help make your next excursion successful. When it’s dark, your eyesight isn’t your biggest weapon in fly fishing. Instead, you depend on your sense of sound and touch to land fish. Photo Courtesy: Chris Cutler. Bryan, Chris, and I spent a few hours each day carefully looking at the stretches of river we wanted to fish. This was more for the benefit of Chris and I, since we didn’t know the river. When the sun set, I was glad we’d scouted. Knowing where big rocks were and the general distance of the bank to a promising seam in the river was invaluable in hooking up with fish. And since we fished both from a boat and the bank, scouting was even more valuable. I think it was the first night when Chris walked downstream to where I was. I was trying not to tangle myself in a bush. He watched me fish for a few minutes, then offered a bit of advice. Chris knows what he’s talking about, so I bit back a snarky retort. Chris’s “Artimouse” flies are some of the best patterns I’ve seen. The retrieve is where I went wrong with my mouse pattern. To an extent, you want the mouse to hit the water hard and swing – just like a streamer. After that, everything changes. A streamer retrieve is full of quick, jerky movements. Mice don’t move like that in water. They’re slower, more cumbersome, and frantic to get out of the water. The trick with the retrieve is to pull the line in short, soft pops that move the fly without it skipping across the surface. Another difference between mice and streamers is that with your mouse, you want a fairly consistent retrieve. Mice swim with a pretty consistent stream of energy until they reach the bank or end up in the belly of a big brown trout. A streamer retrieve is full of quick, jerky movements. With mouse flies, on the other hand, the trick is to pull the line in short, soft pops that move the fly without it skipping across the surface. Photo Courtesy: Chris Cutler. Don’t set until you feel something. I screwed this up more than once. When it’s dark, your eyesight isn’t your biggest weapon in fly fishing. instead, you depend on your sense of sound and touch to land fish. Trout make a big noise when they blow up a mouse, especially if you’re on a quiet river. But don’t set the hook whenever you hear noise. Wait until you feel resistance on your fly, then strip-set like your life depends on it. All things considered, I was pretty surprised at how simple mousing is. I expected it to be more technically challenging, but that’s not where its toughness lies. Learning to fish in the dark – from casting to netting – is like nothing I’ve ever done before. Now all that’s left is for you to find a guide who will take you out at night, or to go it yourself. Either way, you’ll have fun. At the very least, staying up all night on a river is a special experience by itself.